First of all, let me clarify that the “latik” (LAH-TIK) I am referring to in this recipe is the coconut syrup made from mixing coconut milk and brown sugar cooked over medium heat until it forms into a thick syrup. The word “latik” has two different meanings between the Tagalog-speaking regions in the north and the Visayan-speaking group in the southern part of Philippines. In Luzon (northern part), the word “latik” is made from coconut milk cooked slowly until it reduced into golden brown curds and used for toppings in Filipino desserts. This is called “lunok” among the Visayans. Meanwhile, “latik” in the latter group is simply coconut syrup. The Visayan “latik” makes an excellent dessert toppings as well. 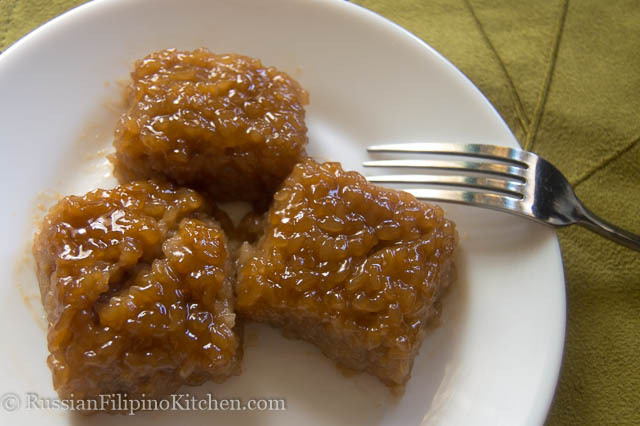 Biko (BI-KOH) is the Filipino term for sweet sticky rice cake. It consists mainly of 3 ingredients, namely: sweet rice, coconut milk, and brown sugar. Some serve it with toppings, some don’t. Others also add vanilla extract, but it’s optional. This rice dessert is popular during New Year’s Eve celebration in the Philippines, because Filipinos believe that if you consume as many sweet treats as you can handle during this time, the coming year will be a good one. This version of biko doesn’t use black/purple sticky rice. Usually my mom and others I know, mix sweet rice with black rice to give it that dark purplish look, which is more of the signature biko recipe that I remember eating. It was called biko tapol. I will make that biko version some other time for this blog. But for now this recipe I will be sharing is equally good and delightful. 1. Place rice in a small pot or saucepan and rinse 5 times until water runs clear. Drain. 2. Add water, stir, and bring to a boil. Once it boils, lower heat to medium low and let it cook until most of the water evaporates. Set aside. (Take note that the rice should be halfway cooked. Don’t worry, it will be fully cooked in the succeeding steps.) 3. Make the coconut syrup or “latik”. To do this, mix 1 cup of coconut milk and ½ cup brown sugar in another sauce pan. Bring to a boil then adjust heat to medium low. Cook for 10 minutes, stirring constantly until it thickens. Remove from heat and set aside. 4. To make the actual biko: Mix 3 cups of coconut milk and 1 cup sugar, stir, and bring to a boil. Add the sweet rice and mix. Cook on medium heat for 30 minutes, stirring constantly until it thickens. You will know it’s ready when oil starts to come out and the mixture gets very sticky. 5. Remove from heat and transfer to a glass baking dish (or any container of choice). Press down to flatten then drizzle with prepared coconut syrup (latik) as topping. 6. Let it cool to room temperature (longer much better) before slicing into serving portions and serve. Place rice in a small pot or saucepan and rinse 5 times until water runs clear. Drain. Make the coconut syrup or “latik”. To do this, mix 1 cup of coconut milk and ½ cup brown sugar in another sauce pan. Bring to a boil then adjust heat to medium low. Cook for 10 minutes, stirring constantly until it thickens. Remove from heat and set aside. To make the actual biko: Mix 3 cups of coconut milk and 1 cup sugar, stir, and bring to a boil. Add the sweet rice and mix. Cook on medium heat for 30 minutes, stirring constantly until it thickens. You will know it’s ready when oil starts to come out and the mixture gets very sticky. Remove from heat and transfer to a glass baking dish (or any container of choice). Press down to flatten then drizzle with prepared coconut syrup (latik) as topping. Let it cool to room temperature (longer much better) before slicing into serving portions and serve. I love this with the caramelized roasted coconut on top! And being it, All Saints day in the Philippines, I miss home. Salamat for sharing your recipe! I can’t wait to make this for the first time!